Here is a sampling of early English sequence dances from the turn of the 20th century. Choreographed by William Lamb, and reconstructed by Richard Powers. 2 bars: Pas de basque (a lightly leaped side-cross-replace) away from partner, then toward partner. 2 bars: Facing partners, taking both hands in open position, do a Double Boston sideways along LOD. (He steps side left, closes right to left, and steps side left again. She steps opposite.) Double Boston is in canter timing, with the three steps happening on 1, 3, 4. 2 bars: Turning to face against LOD, pas de basque away from partner, then toward partner. 2 bars: Facing partners, taking both hands in open position, do a Double Boston sideways against LOD. 2 bars: Rollaway along LOD, with right turn waltz footwork for her, and left turn waltz footwork for him. 2 bars: Taking leading hands (his left and her right), trade places with an outside arch turn. Footwork is four walking steps and a close with weight on 5. 2 bars: Rollaway along LOD, with left turn waltz footwork for her, and right turn waltz footwork for him. 2 bars: Taking leading hands (his right and her left), trade places with an outside arch turn. Footwork is four walking steps and a close with weight on 5. 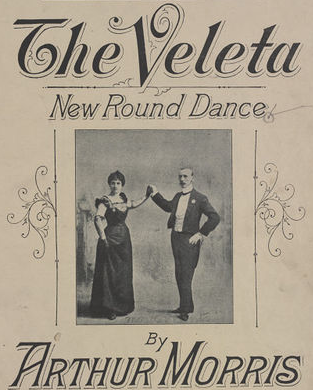 Choreographed by Arthur Morris around 1898 (and published and debuted in 1900), The Veleta is one of the oldest English sequence dances, for one or more couples in waltz time. More than a century later, it still danced in its original form by old-time sequence dance communities. Social waltz groups often dance it in mixer form, as adapted by Richard Powers. Both versions are described below. * This was originally specified as a slide-close-slide forward on the outside foot (in fourth, fifth, and fourth positions), followed by a similar slide-close-slide on the inside foot, but no one, not even sequence dancers, seems to do it this way anymore (if they ever did). Sequence dancers add a "vis-à-vis" style to these steps, angling away from partner, then toward partner. 2 bars: Facing partners, taking both hands in open position*, do a Double Boston sideways along LOD. (He steps side left, closes right to left, and steps side left again. She steps opposite.) Double Boston is in canter timing, with the three steps happening on 1, 3, 4. * Originally specified as "above the shoulders." This style specification remains in the sequence dance version, but has been dropped from the social version. Sequence dancers tend to do all of the Double Bostons (and side-draws below) holding only the leading hand, with the other hand floating or akimbo. To feel more connected, and to make things easier to lead and follow, social dancers tend to take both hands here (or maintain waltz position for the side-draws below). 2 bars: Turning to face against LOD, return to original places with 6 light running steps (he begins right, she left), holding the other hand (the new inside hands). 2 bars: Facing partners, taking both hands in open position, do a Double Boston sideways against LOD, closing up to waltz position by the end of this step (count 4). 2 bars: Do one full turn of clockwise rotary waltz. 2 bars: Do 2 side-draws along LOD (he steps left side, closes right to left, repeats both). These are also in canter timing 1, 3, 4, 6. * In the mixer version, adapted by Richard Powers, the final 2 bars is replaced with: 2 bars: He raises his left arm to let her turn under clockwise, as she waltzes solo LOD to the right side of the next gent ahead of her. He steps in place to receive the next lady who is progressing forward. While Arthur Morris provided a tune specifically for the dance, any rotary waltz with continual eight-bar phrases will do. Cooper 2014 specifies that it was danced at around 50 measures per minute (or 150 beats per minute). At Stanford, an abbreviated version of André Rieu's "Strauss & Co." is often used, hence the name "Strauss Waltz Mixer." All march round the room. Partners stand side by side, lady on the gentleman's right. Gentleman takes lady's left hand in his right, the hand raised above the shoulders; lady holding skirt with right hand, gentleman with his left hand resting on his side. NB Castanets should be used at parts noted in the music. Choreographed by S. W. Painter, and reconstructed by Richard Powers. 2 bars: Walk forward three steps and pause. On the third step, the Lead takes the Follow's left hand in his left. 2 bars: Walking three steps, change places with partner: the Follow turns clockwise under his left arm, as he walks behind her. 2 bars: Walking three steps, the Lead gives the Follow a clockwise free spin diagonally back to the outside lane, as he walks in front of her to the inside lane. 2 bars: The Lead backs up three steps to meet the Follow as the Follow walks forward three steps to meet the Lead. 2 bars: Rollaway with a turning Two-Step along LOD, Lead rotating to the left, Follow to the right. 2 bars: Taking open two hands, step side along LOD, swing second foot over first along LOD, step side against LOD, close first foot to second against LOD. 4 bars: Taking waltz position, do four bars of turning Two-Step, falling away at the end to repeat. Choreographed by Tom Walton, and reconstructed by Richard Powers. 2 bars: Walk forward three steps, starting outside feet, then turn to face against LOD, switching hands. 2 bars: Pas de basque away from partner, then toward partner. 2 bars: Walk forward three steps, starting outside feet, then turn to face partner, taking two hands. 2 bars: Pas de basque toward LOD, then against LOD. 2 bars: Step side, close, side, close along LOD. 4 bars: Four bars of turning Two-Step, falling away at the end to repeat. 2 bars: Starting outside feet, walk four steps forward. 2 bars: Walk two forward, then step side, close along LOD. 2 bars: Balance forward toward to the left of partner (right hip to right hip). 2 bars: Dropping rear hand, the Follow turns under the Lead's left arm with a full turning Two-Step, as the Lead steps side, close, side, close along LOD. Thanks to Richard Powers for the original reconstruction of these dances.